I recommend starting off by prepping your cashew cream frosting here. 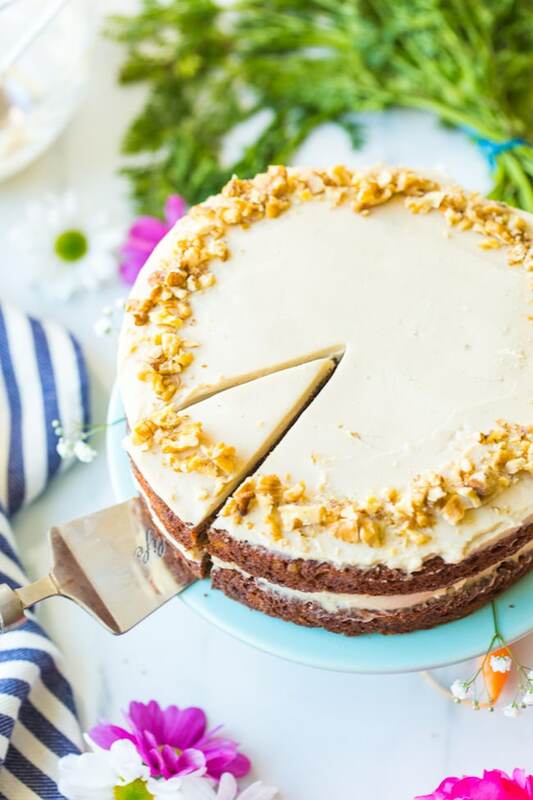 While it takes next to no time to actually prep (so long as you have already given the cashews enough time to soak and soften) you will need to allow time for the frosting to firm up in the fridge or freezer before frosting. All you need to do is throw the cashews into a blender along with the remaining ingredients and blend until you get a thick, glossy cream. Taste and season the cream with a little more sweetener if needed and you’re almost done. Pour the cashew cream to a medium sized freezer safe bowl, cover and pop in the freezer for about 30-45 minutes to firm up. The coconut oil in the frosting will firm up when cold which is what makes this easy to spread and layer later on. The cake portion for this recipe comes from my simple, paleo coconut flour cake. Despite the fact that it’s a paleo cake made with coconut flour & tapioca flour it can easily passes off as a standard, grain based flour cake. 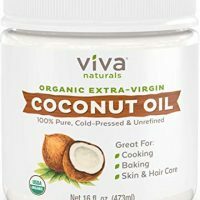 If you’re used to paleo baking then these ingredients are nothing out of the ordinary: coconut oil, coconut flour, tapioca flour, maple/honey etc. Making the cake is really just a matter of mixing together your wet ingredients and the sifting in the dry. Bake at 350 and then sit back and wait until it’s cool enough to frost. 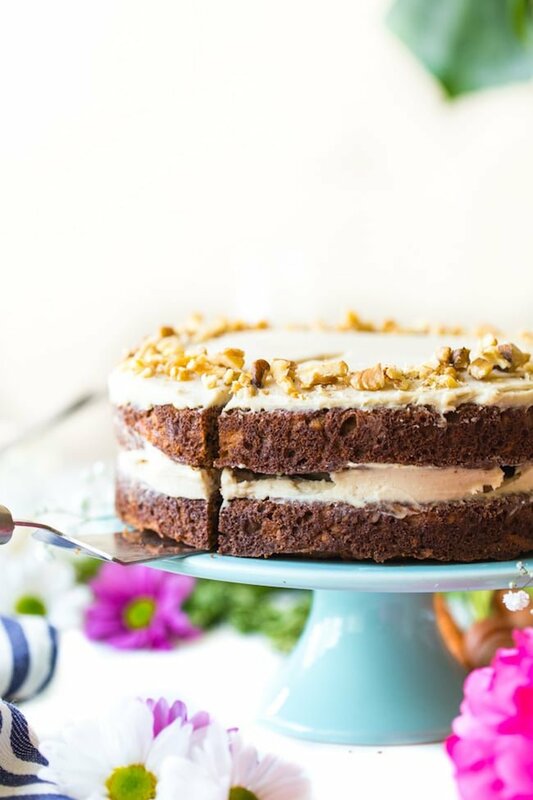 The end result is a carrot cake that’s perfectly tender and moist and just the right amount of sweet & spice. Can I use another combination of flours here? 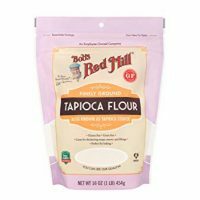 You can use arrowroot starch in place of the coconut flour but I don’t have any other suggestions for the coconut flour. 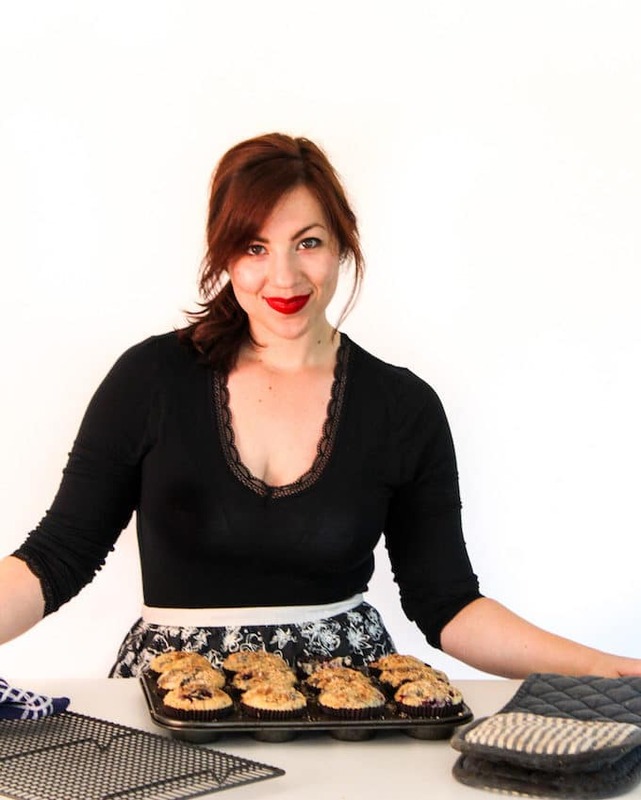 I do however have a paleo carrot cake recipe that uses only coconut flour and carrot cake bars that use almond flour. 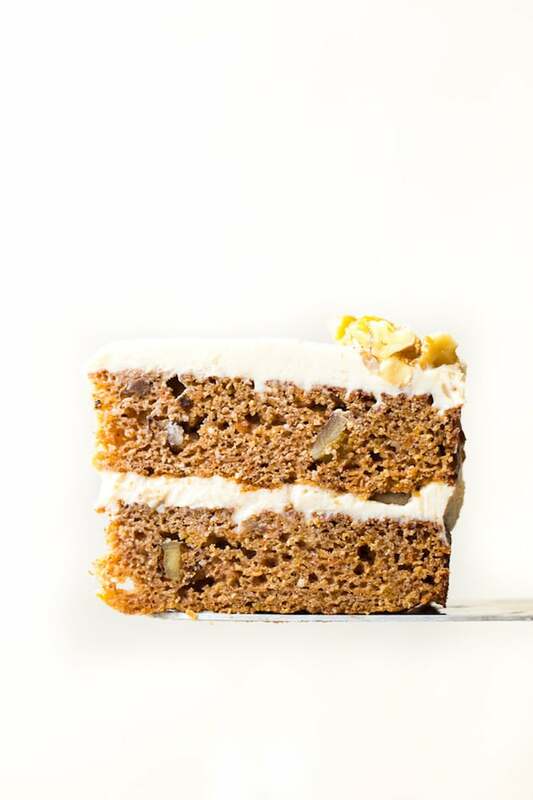 Can I make this carrot cake vegan or egg free? The coconut flour in this recipe really needs the extra moisture from the eggs so I can’t recommend any egg substitutes here. You may be interested in the almond flour carrot cake bars I mentioned above or this egg free coconut flour cake here. Keep this cake stored in the fridge about 3-4 days. You can use maple syrup or honey or a combination of the two depending on your own personal preference. 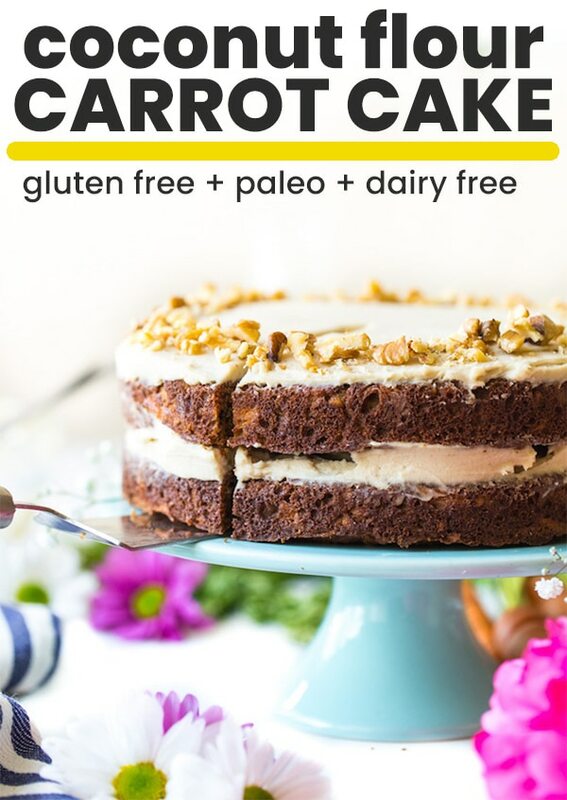 Don’t forget to #asaucykitchen on instagram if you try this Paleo Carrot Cake! We love seeing what you make! You can also post your pictures to my facebook page! Begin making the frosting by adding all of the the ingredients listed under frosting to a high speed blender and process until smooth. Pour the mixture into a medium sized bowl, cover and place in the freezer for about 30-45 minutes to firm up. When it's ready, the frosting should be firm, but you should be able to easily mix it with a spoon. If it's too hard let it thaw until it's ready to handle. Preheat your oven to 350°F/180°C. Grease or line two 8 inch round cake tins. Set aside. In a small mixing bowl, whisk together the dry ingredients (coconut flour, tapioca flour, baking soda, cinnamon, ginger and nutmeg). In another large mixing bowl beat together the eggs. Stir in the remaining wet ingredients (coconut oil, vanilla, vinegar, honey/maple) until combined. Gradually start stirring the flour mixture into the egg mixture. Continue adding until the flour has been fully added and no lumps remain. 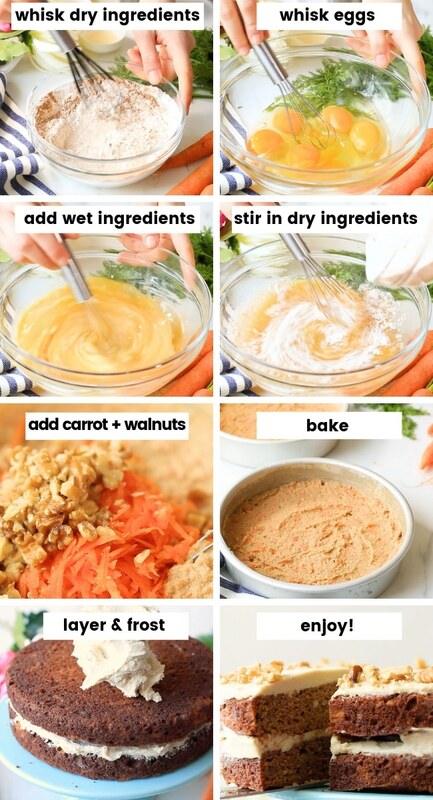 Stir in the grated carrots and walnuts. Evenly divide the batter between the two greased cake tins. The cake batter will likely be very thick at this point so you will need to spread it out with a spoon or rubber spatula. Spread evenly over the bottom and to the sides. Place in the middle of the oven and bake for 25-28 minutes or until cooked in the centre. To check for doneness prick the centre of the cake with a knife or toothpick - if it comes out clean it's done. Carefully remove the cake from the tin and transfer to cool on a wire cooling rack. Once cooled, frost with the cashew cream and enjoy! Keep this stored, lightly covered in the fridge for 3-4 days. Before serving, take the cake out of the fridge for about 10-15 minutes to come to room temperature. *If you don't have a blender powerful enough to blend everything together until smooth you can use 1 cup unsalted/unsweetened cashew butter in place of the 2 cups soaked cashews.